Do you ever have a hard time getting motivated to get moving and exercising? I do. The secret sauce in my humble opinion is to surround myself with people who love to exercise. It’s that simple. And that complicated. It isn’t always easy to find friends who like moving their bodies as much or more than you do. After my second bout with cancer, I knew that moving my body would be a huge key to regaining and then maintaining my health. I made a conscious decision to make certain that I always had friends in my orbit who loved movement. I feel very lucky that for the past almost 8 years, I’ve been able to maintain friendships with exercise loving people. Maybe you’re like me and it’s easy to get overwhelmed with the busy-ness of life. I can get derailed with not that much effort. Which means, staying focused on my exercise program requires near constant reminders and re-calibrations. I’ve discovered over the years that one of the keys to success is to have races on my calendar that I will do with friends. Friends who like me want to be trained up to accomplish the event with a big smile. With friends who like exercising. Last summer, I did the YWCA Minneapolis Women’s Sprint distance triathlon as part of a relay team. I was the swimmer. I had a good time, but I realized as I was swimming the 500 yards, that I hadn’t trained enough and I was struggling physically, more than usual. I hadn’t spent any time with my teammates training. We each did a different sport for the triathlon, so there wasn’t much opportunity to train together. I had started a newish job and I got distracted by it. I decided that this year, I wanted to do the entire triathlon and do it with a group of women who would all do the entire race. 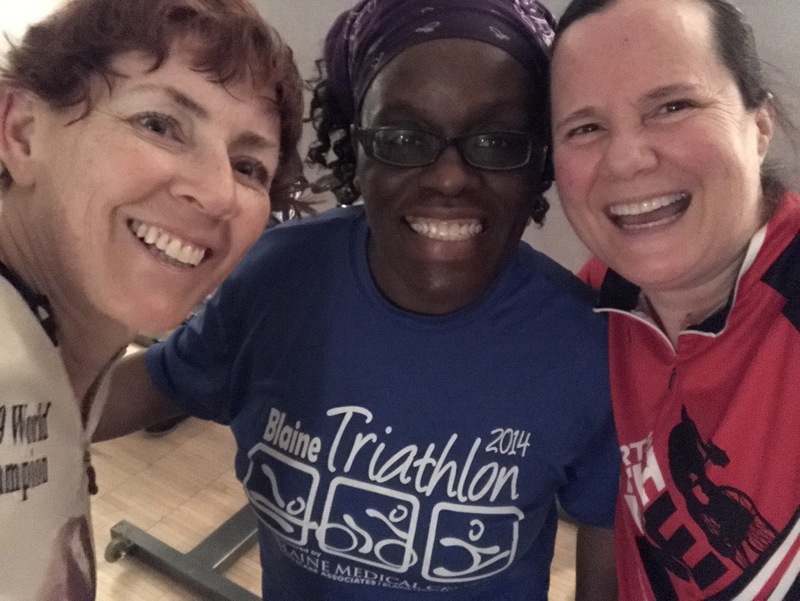 As luck and good fortune would have it, one of the teachers, Brooke, at the charter school where I work part-time, she and her triathlon buddy, Jenny, started a triathlon group for the YWCA triathlon. They invited me to join them. I jumped on board immediately! And I recruited a few others to join in with us. Exercising buddies is awesome. Belonging is SO important! Some of the group, me included, are doing an indoor mini triathlon at the YWCA Minneapolis on April 8th. That means for the past month, I’ve been in training, because I do not want to feel awful swimming and running! I started training for the Tour de Cure at the end of February, so I’ll be in good shape for the indoor bike portion of the mini tri. My first Couch to 5K run in 2018 in my new run shoes! Happy Feet!! 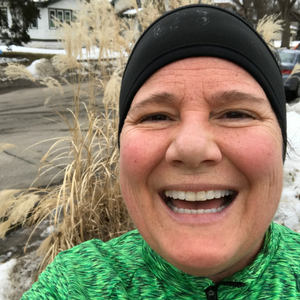 The excitement of doing the indoor triathlon on April 8th, has gotten me outside doing my Couch to 5K training program with renewed energy and enthusiasm. I even went out and bought a much needed new pair of run shoes! My old pair was almost two years old. WAY TOO OLD for run shoes! I am very grateful that the plantar fasciitis pain is gone. Slowly and surely, I’m building up my run exercising muscles again. The secret sauce is to find your people. People who support your efforts to stay moving and exercising. People who inspire you and cheer you on. I’d love to hear how you stay active and motivated with a community of friends! None. I pay a professional coach to write a training plan for me based on the distance I will be racing. Then I pay for the race. If I have a written plan tailored specifically for me, with videos and email support from the coach, I will follow it and have a good race. For my last race, I had a 14 week plan for a 1/2 marathon. I missed one workout total. Way to go! I’m impressed. Hiring a coach who writes a plan based on your skill is very wise!! You inspired me! Wonderful to hear from you!!! Way to go on training for the Napa Valley Tour de Cure!! I rode this morning indoors for an hour and headed out now for a Couch to 5K run/walk!!! You got me inspired!